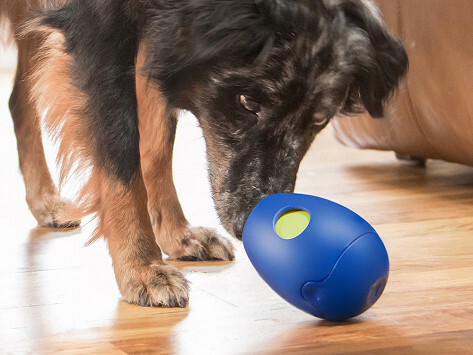 This dog treat toy will keep pups happily engaged—and snacking—for up to 45 minutes. TIKR’s got a built-in timer that’s designed to release kibble and snacks through different sized holes, saving the biggest treats for last. The flexible, rubbery design is easy on dogs’ teeth and gums, too. Recommended for small to medium sized dogs, under 50 lbs. Dimensions: 3.5" x 3.5" x 4.75"
The Shark was well made, but it was too big for our dogs. I ended up giving the toy to a friend with two Golden Retrievers. Puppy just loves it..rather heavy so it’s liud when the dog throws it around..! I ordered one of these even though I have 2 dogs. I guess I thought they would share! So I had to buy the 2nd one so now each pup have their their own toy. The toy is hardy and easy to use. My older sassy dog is impatient and couldn't wait for the next window to open and started chewing on it. It would not budge! TIKR merges playtime and snack time in a fun dog treat toy—and we don’t know many dogs who could resist that combination. Its internal timer is where the fun begins, and it can be set for up to 45 minutes of play. Load the flexible, food-safe, rubbery toy with your dog’s favorite kibble and treats. As the timer winds down, holes in the design reveal the snacks inside, saving the biggest ones for last. 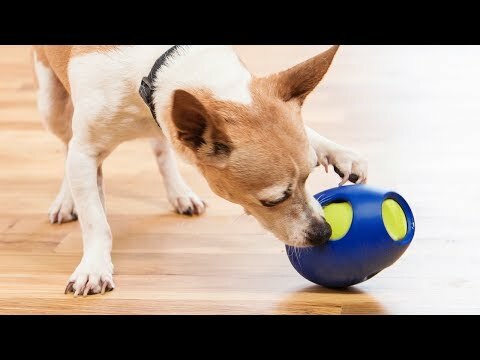 The toy is geared towards dogs 50 pounds and under, keeping them happily engaged (and excitedly waiting) while snacking. And if your dog is a fast eater, TIKR can help encourage them to slow down, too.